Many people are unaware that you can make your own toothpaste and mouthwash very easily at home. The cost of homemade toothpaste and mouthwash can be considerably less than in the price in your local supermarket. The added bonus is that you'll cut out any unnecessary ingredients. Triclosan in particular has been cited as a real health concern. 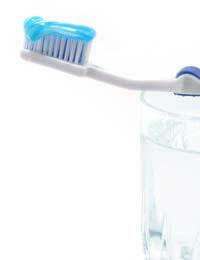 It is believed that the cumulative effects of exposure to this antibacterial compound found in both toothpaste and mouthwash are linked with cancer. There is also concern that Triclosan may at some point become resistant to certain strains of bacteria. In addition, there are been examples all over the world of some counterfeit branded toothpastes being found to contain the toxic organic compound diethylene glycol. This compound is very toxic and can poison and even kill individuals. Aside from these sensationalist (yet true) findings, when you also consider that most people purchase toothpaste as a mouth deodoriser, rather than a whitener, you may realise that there is a much more economical, safe and equally effective way to make your own toothpaste and mouthwash at home. Brushing your teeth and tongue effectively for a minimum of two minutes twice a day will help to rid your mouth of problem plaque. However, brushing alone won't get rid of bad breath and the bacteria that causes it! Using a toothpick and dental floss will help to get rid of food particles in all those hard-to-reach areas. Aside from truly internal problems (in the stomach and intestines) that can lead to bad breath, you can make your own tooth powder that will combat help this problem. One recipe is to simply replace your normal toothpaste with baking soda. Baking soda retains natural deodorising qualities, and is mildly abrasive enough to help remove plaque from your teeth. If you prefer something less abrasive, you can opt for a small amount of salt in place of the baking soda or sodium bicarb. Alternatively, you can try and find powdered sage, and brush with this. Sage is known to be a natural cleanser. As with baking soda, all you need is a penny size worth of powder poured into your hand, and press a damp toothbrush into the powder before brushing. Take 100g baking soda with a small measure of salt. Then for every ¼ cup of your dry mixture, add 15g glycerin. glycerin acts as a sweetener. Then simply add ¼ cup (60g in weight) of water to the mixture and stir in a drop or so of peppermint oil to add a rejuvenating and fresh flavour. If you don't like peppermint, alternative flavourings include almond, ginger, cinnamon and fennel. Once the mixture has become a paste, you can store in a container or squeezy tube if available. It really is that easy! Mouthwashes contain basically the same ingredients as homemade toothpastes. For instance, you can add a few drops of water and one drop of peppermint oil to 1/4tsp of baking soda and rinse in your mouth. Baking soda is a naturally derived way to get rid of bad breath and bacteria. Hydrogen peroxide is another cheap alternative to commercial branded mouthwashes. Simply make a solution using one measure of water to one measure of 3% hydrogen peroxide and swill around in your mouth. Don't swallow - spit the solution out. If you'd rather go for a more herbal route, then sage, rosemary and myrrh can all be infused into water and used as a deodorising or mild cleansing mouthwash. All of these methods will undoubtedly save you money in the long run, and remove the need to expose yourself to unnecessary artificial sweeteners and other chemicals. @graciemac. Yes but ensure you only use those labelled as edible and in the required quantities.